Cheapskater Julie is saving $40 - $60 a week by doing something we all know saves money, time and energy: meal planning. "After reading the hints and tips for menu planning and shopping our family made a monthly menu plan with meals we all like and eat. I then made four weekly grocery lists to go with the planner. This took less than an hour. The lists contain all that is needed to make each meal for that week. I costed out our shopping using the Aldi site so I know what the weeks shop will cost approximately. Now each week all I need is to get my list and shop. Wanting to save money I decided to shop at home the night before I went to the supermarket. Most weeks we can cross off a 1/3 of our list by shopping in our pantry, saving anywhere from $40 - $60 a week. Our grocery bill is now down to about $90 a week for 5 people including extras for lunch and brekkie. We started at $150 and as I had a $150 that was always what I spent out of habit." Julie used the Aldi Smarter Shopping site to cost out her shopping lists. Unfortunately Aldi recently took the site down which is a shame as it was a very handy tool. You don't need a website to make your shopping list and price it though. Use your price book or check prices with either the Coles or Woolworths online shopping sites. 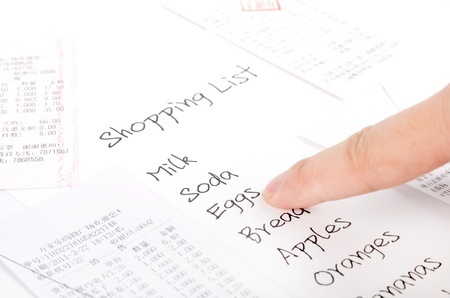 You'll get an approximation of how much your grocery shopping is going to cost regardless of where you shop.